Cell Stem Cell. 2015 Jan 8;16(1):51-66. doi: 10.1016/j.stem.2014.11.004. Epub 2014 Nov 20. Kramann R, Schneider RK, DiRocco DP, Machado F, Fleig S, Bondzie PA, Henderson JM, Ebert BL, Humphreys BD. The common final pathway for end-organ damage in almost every form of chronic disease is fibrosis. This is especially true for chronic kidney disease leading to end-stage kidney disease where specific therapies to thwart fibrosis have eluded us. This is because the mechanism governing pathologic organ fibrosis is still being unraveled. Several key questions persist. Where do myofibroblasts come from? Is some fibrosis in response to injury a good thing? Why does pathologic fibrosis occur? These are just a few questions that researchers have been attempting to solve. Myofibroblasts are cells responsible for collagen deposition and fibrosis. Targeting this pathway represents a possible therapeutic approach to treating fibrosis. But, first many questions exist. Let's tackle the first question. Where do myofibroblasts come from? This question has been debated and debated. Let's look at the possibilities. As depicted in the figure above, myofibroblasts could come originate for several places including bone marrow, tubular cells, peritubular fibroblasts or the pericyte to name a few. Kramann et al hypothesize that the kidney pericytes serves as the precursor niche to myofibroblasts and that these cells play a key role in kidney (and other organ) fibrosis. 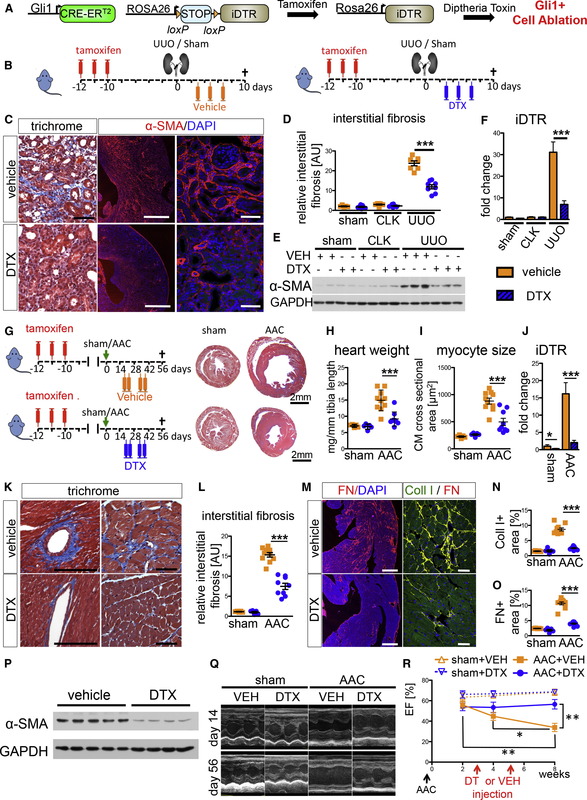 Kramann et al uses a combination of genetically modified mouse lines coupled with multiple organ injury models (kidney, liver, heart, and lung). Pericytes are regulators of vessel formation and have been implicated in many diseases such as diabetic retinopathy. They are also integral in maintenance of the blood brain barrier. Some have speculated that pericytes are organ resident pluripotent stem cells. However, one of the problems in studying pericytes in the lab is the inherent difficulty in finding specific cell surface molecules. A combination of PDGFR-β, NG2, CD13, αSMA, and Desmin have all been reported to mark pericytes. However, these markers can come and go over time so most researchers report a combination of these markers. This brings up to Gli1. Gli1 stands for glioma associated protein 1 (first isolated in a glioma brain tumor. It is an important transcription factor in the sonic hedgehog (shh) signalling cascade. You probably remembered this back in developmental biology, but have long since forgotten. Don't worry, I needed a refresher as well. Check out this video using characters from the Sega video game. The shh signalling system is important for the development of appendages, digits, polarity, R-L, and organs. However, after development the shh system is quiescent until an insult occurs and then the pathway is activated in certain cell types. One of the those cells types being discussed in this paper is a small niche of cells of the pericyte lineage. Let's get to the paper and see what they found. Where do Gli1+ cells reside in the adult mouse? To answer this question the investigators used a mouse line that fluoresces red ONLY in cells that activate the Gli1 promotor. This red fluorescence is further restricted to the adult animal (bypassing all of the Gli produced during development) by administering tamoxifen to the mouse. As you can see in Figure 1A of the manuscript the red cells (or those who expressed Gli1) line seem to coalesce around blood vessels and co-stain positive for PDGFR-β (a marker pericytes) and negative for CD31 (marker of endothelial cells). Figure 1C shows perivascular staining in the kidney, liver, lung, heart, bone marrow, and muscle again restricted to PDGFR-β. Now, are all pericytes Gli+? To answer this question they went back to the reporter mouse and performed flow cytometry to count the number of cells that were both "red", thus lineage tracked for Gli1 and PDGFR-β. The "red" cells only compromised 0.02-0.9% of PDGFR-β+ cells except for bone marrow (33%). So, only a small fraction of "pericytes" express Gli1 under basal conditions. Does this small subset of "pericytes" have typical stem cell characteristics? To answer this questions the authors first sorted cells using the Gli1 "red" florescent mouse and showed that these cells do in fact expressed CD29, Sca1, CD44 and CD105 as shown in Figure 1E. They next went on to show that they can divide quickly (Figure 3 BCD) and have tri-lineage differentiation capability. That is, these gli1+ cells from kidney, liver, lung, heart, bone marrow, muscle can turn into osteoblasts, adipocytes and chondrocytes under the right conditions Figure 1D. IMPRESSIVE. Appears as if they do. Could they be the cells that turn into myofibroblasts leading to end organ scarring and fibrosis? What is the fate of Gli1+ cells after organ injury? This is where things get interesting. The authors use 6 models of injury in 4 different organs (kidney, heart, liver and lung). They then use the same mouse that fluoresces "red" and in essences tags or lineage traces Gli1+ cells in order to see what these cells eventually become when organ injury is induced. They show in Figure 4 that a majority of myofibroblasts from all of these models of organ injury co-label "red" and thus came from Gli1+ cells. So, myofibroblasts originate from Gli1+ cells in the adult animal. What happens to organ fibrosis if you remove this subpopulation of cells before the injury? This will be an important experiment to demonstrate if this system can be exploited to decrease the amount of fibrosis. The investigators used a common strategy to eliminate specific populations of cells. They wanted to eliminate all cells that expressed Gli1+ as an adult in the mouse. They bred the tamoxifen sensitive Gli1 Cre mouse with the diphtheria toxin mouse. Mouse cells are inherently resistant to diphtheria toxin (unlike human cells). So, this genetically modified mouse will render ONLY the Gli1+ cells in the adult mouse sensitive to treatment with diphtheria toxin. They next induced organ injury similar as above while depleting the Gli1+ cells from the mice. This resulted in significantly less organ fibrosis in the kidney and heart as seen in Figure 7. Thus, pointing to the importance of these cells in the generation of myofibroblasts. Conclusion This is an impressive study. 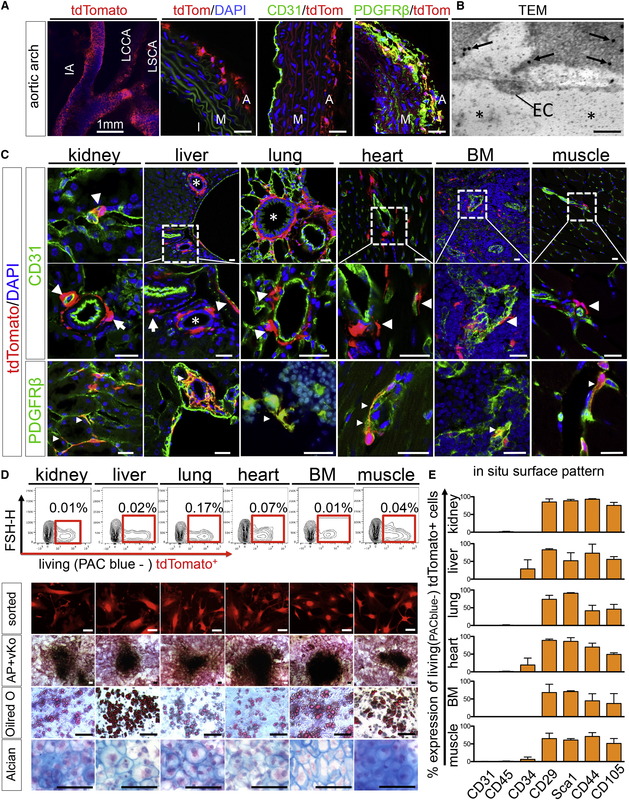 These authors show that Gli1+ cells form an extensive network form the adventitia of large arteries to the pericyte niche in capillary beds of multiple major organs. They show that Gli1+ cells express the typical mouse mesenchemyal stem cell surface molecules in vivo and possess a trilineage differentiation capability in vitro. They also show that Gli1+ cells undergo proliferative expansion after injury and differentiate into myofibroblasts in vivo. These Gli1+ cells are resident of the organ undergoing injury and do not come from bone marrow or the peripheral blood. 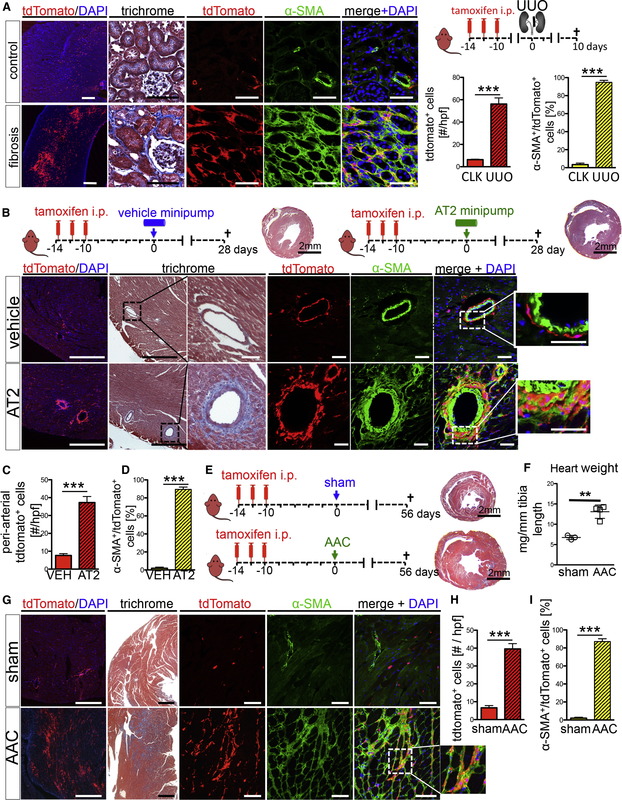 Most importantly, they show that ablation of Gli1+ cells results in amelioration of heart and kidney fibrosis. What is the next step? Well, this group just put out their next paper in the JCI where they dissect the entire Gli signalling system and show that they can pharmacologically inhibit this system by antagonizing Gli2 to reduce kidney fibrosis. The also show that this system is upregulated in the fibrotic kidney of humans. These are exciting studies with much more research soon to follow. Is this the fibrosis pathway we have been searching for? Will it lead to novel therapies? Only the future will tell.